Spain has been on my mind lately. I recently wrote a post about the San Fermin festival, and it seems as if everyone in the twitter/travel blogging world is talking about their recent holidays in Spain. And why not? Spain is fascinating and fun country to visit. I spent a few weeks there with some girlfriends in ’98 on our European campervan tour, and I’ve been dying to go back since. Here are my top 5 reasons for memorable Spain holidays. There is no doubt the Spaniards know how to party. Just a regular evening begins at 10pm for them and carries on into the wee hours of the morning. Festivals in Spain are the wildest of parties you could ever hope to be invited to. They involve lots of dancing on the street, drinking copious amounts of Sangria, and strangers celebrating together like long lost friends. The Running of the Bulls is my favorite festival to date, and I hear La Tomatina festival is just as fun. Who wouldn’t want to visit a country that spends a day each year throwing tomatoes at each other all in the name of good time? We stumbled upon many other smaller festivals along our campervan tour. One was in Seville where for some unremembered or unknown reason, the streets were alive with revelers, music, art, fancy dress, and a lot of good eye opening fun. Does a drink ever get any better than this? I don’t even know if it is the taste I love so much or that it conjures up so many great travel memories, but every time I hear the word Sangria, I sigh a joyful sigh. 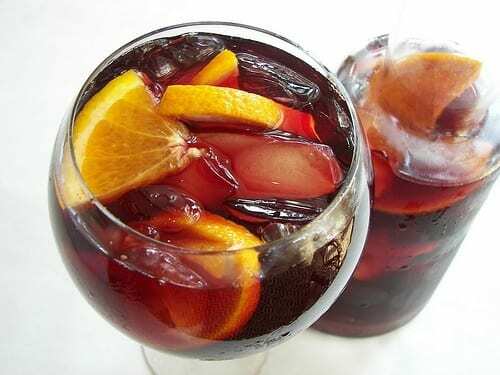 Sangria is a refreshingly fruity summer drink and found everywhere, especially when you attend the festivals. It is a mix of red wine, fruit, soda and brandy although when we were drinking it in San Fermin it was vodka instead- dangerous. Spain has some really beautiful beaches to spend your days soaking up the rays of the sun and your evenings toasting to it as she sets. We stumbled upon a beautiful beach, La Barossa on the South Coast on our campervan tour. The couple of days we spent with friends swimming in the ocean, camping out on the beach, enjoying magical sunsets and beach parties were some of my best days in Europe. 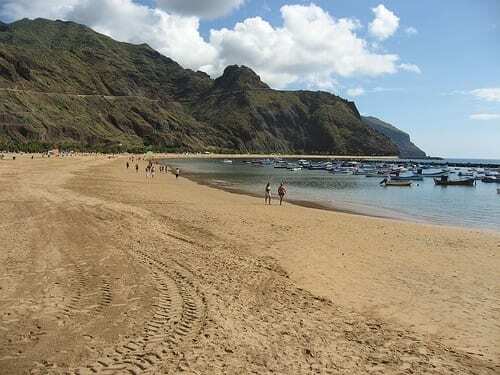 Spain has many islands (a favorite holiday destination of the British) to spend time on, either relaxing or partying. Ibiza is the place to have a mad dance party experience, and for a less hectic experience taking Tenerife holidays are probably a better choice. 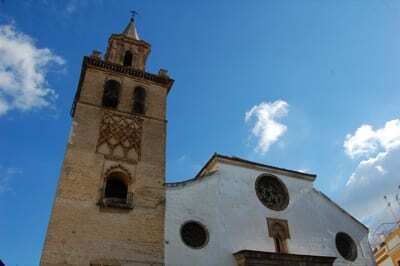 Looking for a secret hidden destination in Spain? 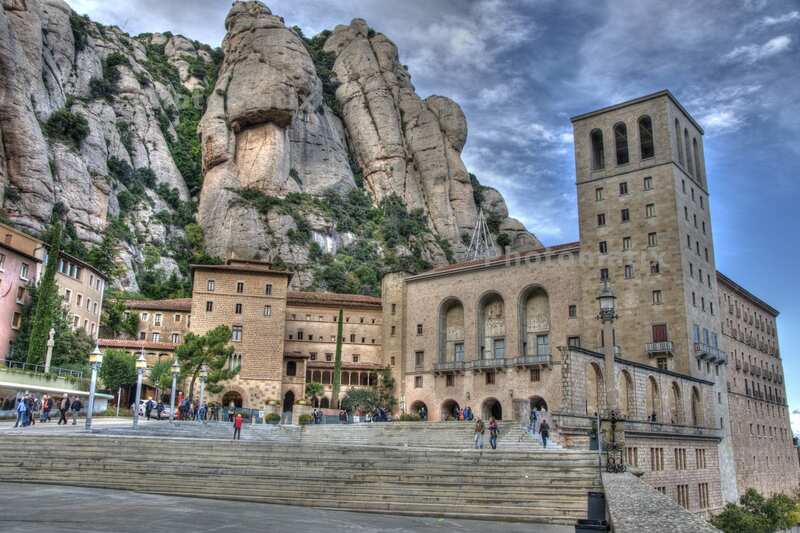 Check out this World Heritage Site that made this list on destinations in Europe on a budget! Every country will have a uniquely special city to remember, whilst most others fade into the background. Spain is unusual in that it has way more than one city that stands out, in fact it seems as if every city you visit is architecturally beautiful, aesthetically pleasing, with an incredible amount of history and culture for you to absorb. Stuck in the middle of the country, I thought Madrid was going to be a passing through bore, but I was pleasantly surprised to find it full of sculptured gardens, fountains, impressive monuments and palaces, gypsies, markets, and great restaurants. 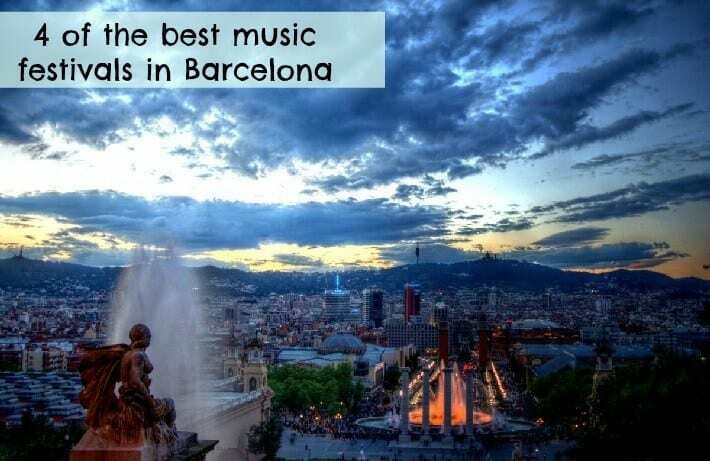 You could spend days walking around Barcelona, marveling in its unique architecture and parks, and playing on its streets. 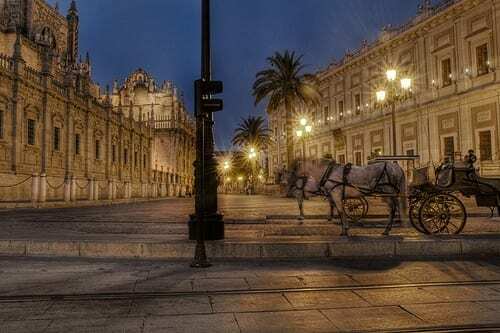 Charming cities such as Seville with its towering cathedrals, small cobble-stoned streets, and riverside bar atmosphere leave you wanting to get lost in the vibrancy of their streets forever. Spain is close to several countries, the most out of the way being Gibraltar and Morocco. I remember driving along the Mediterranean coastline road from La Barossa to Gibraltar and seeing Africa in the distance. I was incredibly excited by the thought of it being so close. When we arrived in Gibraltar we decided with it being so close, there was no way we could not pop over to say hello for the day. 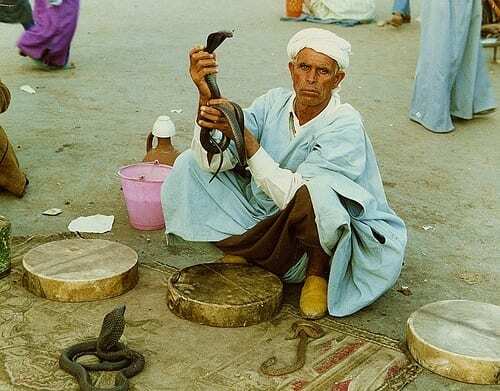 After a quick ferry ride we found ourselves on African soil where we ate couscous, dressed in Moroccan robes, were mesmerized by snake charmers and conned by carpet sellers. It was fantastic. I didn’t know anything of Gibraltar until we arrived there. It is a small colony of Britain tucked in the south east corner of Spain, made famous by its big protective rock fortified with cannons and military tunnels and stalagmite caves. It was a wonderful little place to explore for a day or two. Its pubs were packed with travelers on the day we were there as South Africa was playing New Zealand in the rugby. Snakebites and drinking games all round! I left Spain with not one bad taste in my mouth, having instead a multitude of joyful memories to carry with me forever. I absolutely loved traveling through Spain. I’m thinking of going back for summer next year. Craig hasn’t been there so I’d love to throw tomatoes at him and drink Sangria while he runs with bulls. Booking.com in Spain. You get free cancellation on most rooms and a best price guarantee. These are just some of the few reasons why Spain is such a great holiday destination. What are your reasons for visiting Spain? When I was working I spent 24 hours on a work jolly in Barcelona and LOVED it. Apart from having friends who I’d love to visit in Malaga, I was fascinated by Parc Guel, the Sagrada Familigia and all the amazing Gaudi architecture there – its out of this world! Spain is one of my favorite countries. I did study abroad in Salamanca 10 years ago & I’d love to visit the country again with a different perspective. Sevilla & Granada are probably my favorites & the tomato fight is high on my list. Man I need to get back there!! Don’t forget Tapas! One of my favourite experiences in Spain has been eating authentic Tapas with a glass of Spanish red wine – it can’t be beaten! I’m glad someone else could recommend tapas. I wanted to put it in but I’ve had no experience of it in Spain as we were going ultra budget and cooking all our own meals from our campervan!! Next time…. I’d also like to participate in the “Running of the Bulls” festival as well, but it’s not on the list. I love your bucket list and the quote you used at the beginning is brilliant- one of my new favorites. You must put the Running of the Bulls on your list, it is sooooo much fun! All of the above so true. Spain will always have a piece of my heart. It was my first international trip back in 2002… it popped my traveler cheery. ha! What’s really interesting about the Spanish cities is that they are all different from each other, but at the same time preserve a certain cohesive quality that lets you know you’re in the same country. If you go cross country from Bilbao or San Sebastian at the north, all the way down to Sevilla you will see this huge contrast in every step of the way. You never forget your first hey!! Spot on about the cities- they are all worth remembering for something different. You had me at sangria! But oh how I wish it was less expensive to travel there @travelsofadam calculated his expenses at $70/day which is twice what I’m paying in Latin America. Yeah that hurts a lot! It wasn’t that much for us when we were there. It was many years ago, but we were also living out of a campervan. We didn’t pay for accommodation as there was free parking everywhere and we cooked all our own food and drank alcohol from the supermarket mostly. (That’s why I couldn’t really put tapas or paella in here as we never ate out!) There are cheaper ways you can do it but Latin America does sound more attractive in terms of budget. Spain is a heaven in a real manner. During summer time it is awesome place. It has all the features which are liked by each tourist. Beautiful beaches, awesome culture, fabulous night life, bars and many more under one destination, that is SPAIN. One thing i forget to explain its last but not least, luxurious villas and apartments. I recommended to all tourists, if they want to enjoy there trip and travel,they must visit Ibiza.I like the post. Caz, you seem to know Spain quite well)) Pretty good points. I would only add one more special point: Tossa de Mar! A small boat town in Catalunya, so endlessly beautiful! As for me I can’t go to Spain and skip Tossa. I went for lovely 3 day getaway in Spain and what a beautiful place it was. I went with my wife at the end of last. The weather was actually spot on luckily! We were trying to save money on this trip. Some of the restaruants were simply fantastic however and the fresh sea food was incredible (we don’t cheap out on food ha). We stayed were near Playa Veneguera and the roads were very bumpy so a good rental car was essential (another expense). Does anyone else have any money saving tips when going away?